Vardia is being torn apart by a civil war between the religious sect known as the Awakeners and the government forces under the command of the Archduke. Despite helping start the war (inadvertently), Darian Frey and the crew of the Ketty Jay are trying steer clear of any fighting. However, when Frey decides to track down the missing Trinica Dracken, the crew find themselves with divided loyalties. After four novels, it's time for The Tales of the Ketty Jay to bow out. The author had the choice between making the series an ongoing cycle of adventures or wrapping up the main plot to concentrate on other works, and chose the latter. Whilst this is bad news for fans of the series, it's certainly good to see a series reaching a definitive conclusion after a short, focused number of adventures. This does cause some problems for The Ace of Skulls, however. In previous books it felt like Wooding was developing a large number of background elements, characters and factions to play a long game with. Having to wrap everything up in this fourth volume means the plot accelerator being slammed down and the concluding chapters taking on an everything-and-the-kitchen-sink approach. This means that a few plot elements get short shrift and are resolved in a slightly more perfunctory fashion than might be wished. However, the most important thing in this series is the characters and their relationships, and Wooding wisely concentrates on these elements. All of the crewmembers of the Ketty Jay get their moment in the sun, whether it's Pinn's undergoing a gloriously narcissistic and insane odyssey of faith and selfishness, Crake finally resolving his family issues or Jez finally confronting her heritage in full. Secondary characters return, such as the Century Knights, and get a lot of juicy moments as well. In short, the character arcs of the series are resolved more than satisfactorily. Hell, even the ship's cat, Slag, gets his own subplot. In terms of the story, we are again whisked across Vardia, from the capital city of Thesk to a vast, Mississippi-style delta and to exotic islands and back again. There are robberies, infiltrations of enemy bases and epic battles at snowcapped mountain villas. There are massive aerial engagements, dodgy mid-air boarding actions and, erm, fierce cat-to-mouse combat scenes deep in the bowels of aircraft. It's the sort of narrative that cries out for words such as 'romp' and 'fun'. 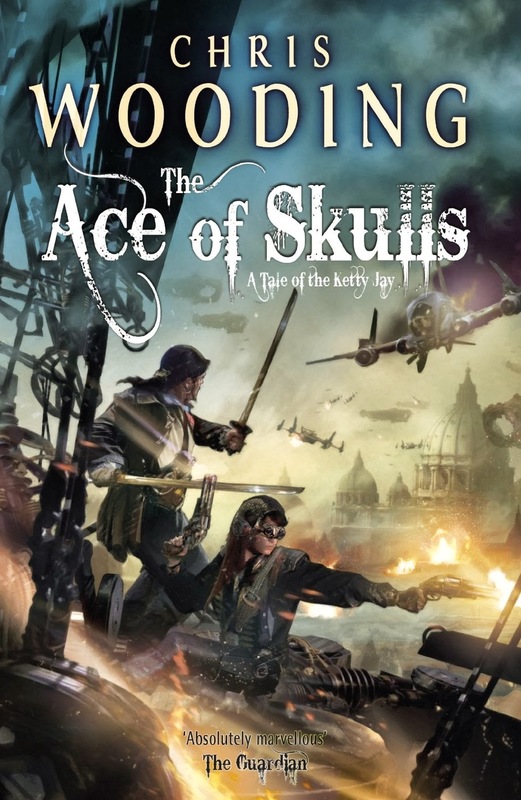 As with its three forebears, The Ace of Skulls is a highly enjoyable action-adventure novel with some excellent characterisation. It's also resolutely not grimdark: whilst there are genuine moments of horror, ultimately the ending is positive (despite a couple of shocking, major deaths) and the series bows out on an emotional high. The Ace of Skulls (****) is fun, well-characterised and a page-turning read. It's also trying to do a little bit too much in wrapping up a huge amount of material in a limited page space, but it manages to pull it off. And whilst Wooding does wrap most things up, there's certainly enough scope here for him to return to the world further down the line. Personally, I'd love to see a Century Knights spin-off. The novel is available now in the UK and next year in the USA. Glad the character stuff is still strong. I always liked the way there was undeniably a focus on just one or two per book, but you got a real sense of all the others developing in the background, not just marking time until their turn in the spotlight came up. Would it be possible to just read this one and have it function as a stand-alone? No. You really need to read all 4.